Do not let others look into its surface, this tool of divination must remain completely your own. Keep it covered when not in use. Frequently recharge the mirror by allowing the full moon to shine upon the black glass surface. Practice the visualization exercises described following until mastered. Generally, scry using the mirror at night, preferably during the full or new moon, depending on your intended outcome. The mirror can be used at any time, but tends to work better at these points. When indoors, light two votive candles, one on each side of the mirror. Use white or colored candles appropriate to the work: blue for healing, purple for psychic work, orange for communication, and so on. Burn lunar or psychic blend incense before working with the mirror. Now open your physical eyes and gaze into the mirror, remain relaxed and don’t hesitate to blink when necessary. Relax the focus of your eyes but remain alert. After a while, the surface of the mirror will begin to change and fade; a dark mist will appear. Your inner eyes will not open, and the journey into the mirror begins. Remember that the inner eye sees inside the mind, through the magickal imagination. Most people when scrying don't see the images appear with the physical eyes on the mirror's surface, but see within the mirror and in the mind's eye. 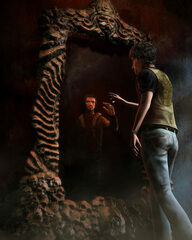 The mirror acts as a focal point, a gateway within. When you have completed your journey or the work you set out to do, begin the return to your body and ordinary senses. Breathe fully and deeply, and remain still until you feel you have completely returned. Now close your eyes and remember all you saw and felt during the scrying or journey. Review your entire experience mentally.